Looking south from Endurance Gold’s Wolverine Project, part of its Elephant Mountain Project near Eureka, Alaska. Photo courtesy Endurance Gold Corp.
Driving through downtown Fairbanks, one can’t help but notice the license plates, “Alaska the Last Frontier” long synonymous with the State of Alaska, the words last frontier are taking on a different meaning for the mineral industry. Alaska may well be the last place in the United States where discoveries of significant size continue to be made near surface and in a state that remains relatively underexplored. With a landmass of 1.7 million km2, nearly 6 times the size of Nevada, it’s little wonder that opportunity still remains. Alaska hosts some of the most geologically diverse terranes in North America with over 4,400 known gold prospects, and over 2,700 occurrences of other minerals, including some of the world’s largest deposits. The state offers something for every explorer and investor ranging from rare earths to base metals as well as oil and gas wealth, all within the confines of an encouraging and stable North American jurisdiction. Alaska has a long history with mining and resource development. Placer gold production in Alaska dates back to the 1870s and mining activity continues today, with Alaska being the second largest gold producing state in the US after Nevada. Nevada produced in excess of 5.6 million ounces of gold during 2017. Between Alaska’s four operating gold mines, Fort Knox, Pogo, Greens Creek and Kensington, annual hard rock gold production for Alaska was just under one million ounces in 2017. In addition to lode mining the placer mining industry remains an active component of the mining industry today with over 236 placer mines. Alaska currently hosts 2% of the world’s gold reserves and nearly 200 million ounces in as yet unmined gold resources. Notwithstanding its gold production, Alaska is also host to the world class Red Dog and Greens Creek polymetallic mines. Hecla Mining Company’s [HL-NYSE] Greens Creek Mine is the US’s largest silver producer and produces in excess of 7 million ounces of silver a year, often at a production cost of less than $5 per ounce of silver. The Teck Resources [TECK.B-TSX; TECK-NYSE] Red Dog Mine is one of the largest and highest-grade zinc-lead deposits in the world and the recent discoveries of the nearby Anarraaq and Aktigiruq deposits will likely extend the life of this district. Not only is Red Dog a world class deposit, it is a testament to what can happen when industry, government and native corporations work together. Unique in North America, Alaska settled all of its outstanding native land claims in 1971 with the creation of 13 regional corporations, 12 of which own an aggregate 44 million acres of land, which includes native ownership of both the subsurface and surface mineral and resource rights. One of the stipulations of this landmark legislation was that only one Regional Native corporation could own a given acre of land at any given time, eliminating the possibility of multiple Native land claims on a single parcel of land. In addition the legislation provides that all Native Alaskan corporations share amongst themselves in the benefits from mineral activity under the 7(i) and 7(j) provisions. These provisions not only address royalty sharing among the corporations but also provide opportunities for jobs and business partnerships for shareholders. An example of how this revenue share can work is found in the incredibly successful Teck-NANA partnership. NANA is the regional native corporation who is the underlying landowner at Red Dog. Of the $247 million received by NANA Corporation from Red Dog in the 2017 fiscal year as net proceeds, $156.4 million was distributed to other Alaskan regional, and village corporations. NANA received $1.5 billion in net proceeds from Red Dog and paid more than $1.0 billion to other regional and village corporations between 1982 and 2017. In addition, over 55% of the jobs at Red Dog are filled by NANA shareholders. Other well-known successful and long-term company native partnerships include: NovaGold’s and Barrick’s Donlin Gold development-stage project with Calista Corporation and the Kuskokwim Corporation, and similarly Trilogy Metals’ Upper Kobuk mineral agreement with NANA. More recently Constantine Metal Resources signed a lease agreement with the Cook Inlet Native Corporation to explore the Johnson Tract project. Alaska also leads the way in the United States with an innovative way to fund mental health programs by utilizing revenues from natural resources for the betterment of its citizens. Unique in the US are the Mental Health Trust lands managed by the Trust Land Office, which administers about 1 million acres of land in several different asset classes, including both mineral exploration and production. Revenue from these lands help support a comprehensive integrated mental health programfor Alaska. Mining remains an important component of the state economy. Some 4,500 jobs are a direct result of the mining industry and another 9,000 jobs are an indirect benefit from the industry. With some of the highest annual wages across Alaska (average US $108,000) mining contributed approximately $60 million in 2017 to state government revenues from taxes, royalties and rental payments. Already well known for its placer gold production, Alaska’s lode gold production has been reasonably limited so far, with only 20 of the 61 placer gold districts recording lode gold production in excess of 1,000 ounces. Today there are over 200 million ounces of lode gold resources delineated in 21 of these districts, leaving a vast majority of the state wide open for future gold discovery and resource delineation. The most prolific placer gold district in Alaska remains the Fairbanks District. It is here that over 10 million ounces of placer gold were mined and to date over 10 million ounces of lode gold has been produced with several new projects underway. In comparison, placer gold production from the Yukon, (Klondike Goldfields) is estimated at anywhere between 10 -20 million ounces with as yet no significant lode production. Since 2010 over C$700 million has been invested in acquisition, resource definition and exploration in the Dawson district in Yukon. Approximately 7 million ounces of lode gold have been delineated. Conversely investment in the Fairbanks District has remained relatively modest but nearly the same number of ounces has been delineated over a similar time period. Companies active within the Fairbanks District include Kinross Gold [K-TSX; KGC-NYSE], owner of the Fort Knox Mine, a large low-grade mining operation that is currently the largest lode gold producer in the State. Started originally as a milling operation in 1997 with a 10 year mine life, the mine has transitioned into a hybrid milling and heap leach operation. As the first successful large-scale northern heap leach operation the mine is a testament to both the innovative spirit, and technical skill of many of Alaska’s miners and developers. In 2017 Kinross produced 318,115 ounces of gold from both the heap leach and milling operation. In June Kinross announced that mining at Fort Knox would be further extended to 2027 and heap leaching to 2030 as a result of the delineation of an additional 1.5 million gold equivalent ounces from the initial Gilmore expansion project, west of the current pit. The Freegold Ventures [FVL-TSX] multi-million ounce Golden Summit project is located in close proximity to Fort Knox. Both Fort Knox and Golden Summit are road accessible and located in close proximity to Fairbanks, which has an experienced work force and a mining friendly culture. Freegold has delineated a large gold resource within a project area with over 80 historic lode gold prospects. A Preliminary Economic Assessment (PEA) was completed in early 2016 and work is now focused on expanding the already significant oxide resource to improve the overall project economics. Between 2011 and 2013 a global resource of ~ 6.5 million ounces of gold (indicated and inferred) was delineated at a 0.3 g/t cut off. The current pit constrained resource is 1.36 million ounces in the indicated category and 1.58 million ounces in the inferred category at an overall grade of 0.69 g/t gold, with considerable room to expand the resource at higher gold prices. The PEA contemplates an initial oxide heap leach recovery of 640,000 ounces of gold at a grade of 0.44 g/t with a follow on milling operation of 1,641,000 ounces of gold at a recovered grade of 1.06 g/t over a 24 year mine life. Continuing 120 km north of Fairbanks along the Elliott Highway is the International Tower Hills Mines [ITH-TSX; THM-NYSE] Livengood Gold Project. Between 2006 and 2014, 218,070 metres of drilling successfully delineated a global resource of nearly 20 million ounces of gold. With over US $220 million spent, the project has now advanced through a pre-feasibility level. The current pre-feasibility uses a cut-off grade ranging from 0.32 g/t – 0.4 g/t depending on rock type. In measured and indicated categories the resource contains 525,380,000 tonnes at a grade of 0.68 g/t for 11,461,170 ounces of gold with an additional 52,800,000 tonnes at a grade of 0.52 g/t adding an additional 1,127,210 ounces of gold. Present activities on the project are focused on optimizing recoveries and baseline environmental work. Like so many exploration projects in Alaska significant exploration upside remains as the current resource covers only 1 square mile of the 75 square mile land package. Literally across the paved Elliott Highway from International Tower Hill’s Livengood project lies the Freegold Ventures Shorty Creek Project, a newly discovered copper–gold porphyry district covering an area of 100 km2. Limited drilling at Shorty Creek by Freegold has returned significant copper, gold, silver and tungsten intercepts. Highlights of the drilling include 434.5 metres of 0.36% copper, 0.12 g/t gold, and 7.46 g/t silver and includes 207 metres at 0.045% WO3 (tungsten) at the Hill 1835 target. Already exhibiting the potential for significant tonnage, this known mineralization covers a 300m x 500m area with a depth extent of at least 500 metres, and remains open for expansion. Hill 1835 is only one of the six high priority targets areas identified so far at Shorty Creek. Also in the Livengood area further west along the Elliott Highway, Endurance Gold [EDG-TSXV] is exploring the Elephant Mountain Project. Elephant Mountain currently hosts at least six high priority drill ready targets over a 12 km trend, which are all interpreted to be part of the family of intrusion-related gold systems similar to the Fort Knox Mine, Pogo, Golden Summit, Livengood and True North deposits located in the nearby Fairbanks District. Two of the gold targets have been drill-tested by Endurance resulting in highlights of 4.09 g/t gold over 4.6 metres in the South Zone and 0.40 g/t gold over 147.1 metres in the North Zone, with these intersections in drill holes separated by 1.4 km. The four other priority targets remain untested by drilling and are represented by kilometre-scale soil anomalies (up to 2,330 ppb gold), large chargeability anomalies and gold-in-rock values up to 10.35 g/t gold. This year’s program is expected to include trenching on the best undrilled soil anomalies and further sampling in order to define future drill targets. Further north and west into the Ambler District lies Trilogy Metals’ [TMQ-TSX, NYSE] and partner NANA, Inc. have pooled assets to hold two world-class ore deposits, the Arctic volcanogenic massive sulfide deposit and the nearby Bornite carbonate replacement copper-cobalt deposit. In 2017 Trilogy successfully attracted South32 Limited to partner in further developing these very significant assets. Under the agreement South32 will be able to earn a 50% interest in the Upper Kobuk Mineral project’s joint venture, which includes the Arctic and Bornite projects, by expending US $150 million as well as contributing to the amounts that Trilogy spends on exploration at Bornite during the three-year period. The Arctic deposit currently hosts a reserve of 43 million tonnes grading 2.4% copper, 3.2% zinc, 0.59% lead; 0.49 g/t gold and 36 g/t silver. The 2018 program will include geotechnical and hydro engineering studies on the proposed waste and tailings sites aimed at advancing the engineering design for these facilities to a feasibility level. 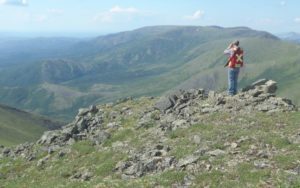 At Bornite, 25 km southwest of the Arctic deposit, a NI 43-101 report released in 2016 outlined a 6 billion pound copper resource, and an 8,000 metre diamond drill program is expected to be completed here this year. Trilogy, South 32, and NANA have been working with the Alaska Industrial Development and Export Authority (AIDEA) which submitted permit application to five federal agencies for the Ambler Mining District Industrial Access Project (AMDIAP), a proposal for the construction and operation of a 340-km long all-season controlled-access industrial road connecting the Ambler Mining District with the Dalton Highway in order to facilitate the exploration and development of the Ambler Mining District, which could have multiple mines. Created in 1967 by the Alaska State Legislature, AIDEA was formed to “develop, encourage and improve the economic welfare of the people of Alaska”. Instrumental in the development of Red Dog Mine, AIDEA provided US $265 million in cash and bonding to finance the DeLong Mountain transportation system and Red Dog port site facilities, which are being repaid through a toll structure. AIDEA has played a major role in the financing of large projects, covering a wide gambit of industries in order to facilitate growth opportunities for Alaskans through a variety of mechanisms, including debt, equity and other enhancements. AIDEA’s revolving fund currently has about US$1.3 billion in assets and since 1997 has paid an annual dividend of about US $392 million to the State. Millrock Resources [MRO-TSXV] continues with their successful project generation model. Millrock currently holds several projects covering a range of commodities throughout the State, including copper and copper-gold resources at its Caribou and Zackly deposits, respectively. A 5,000-m program is currently underway at Zackly with partner PolarX to increase the JORC-compliant resource (measured, indicated and inferred) of 3.4 million tonnes grading 1.2 percent copper, 2.0 g/t gold and 14 g/t silver. At its nearby Caribou Dome copper deposit, current resources include 1.6 million tonnes of near-surface material averaging 3% copper (107.8 million lb) copper; and 1.2 million tonnes of potentially underground mineable resource averaging 3.2% copper (82.3 million lbs). Millrock holds a 9.76% shareholding in PolarX, an Australian exploration company. In addition, Millrock also holds a joint venture agreement with Kinross Gold on its Liberty Bell Project, targeting a copper-gold porphyry and associated gold deposit model. Kinross can earn a 70% interest by expending US $5 million over 4 years. Millrock is also active in the Goodpaster District where it has developed a compelling target on its West Pogo claims. Sumitomo recently announced a gold discovery just east of the Millrock Sumitomo claim boundary. Sumitomo’s Pogo Mine, Alaska’s second largest gold producer is another Alaskan success story. Originally starting with a 10-year mine life in 2006 and 3 million ounces, exploration is continuing to successfully increase the mine life with production now expected to continue until 2021. Producing 271,273 ounces in 2017, Pogo is expected to pour its 4 millionth ounce in 2019. The current exploration budget of US $21 million is focused on expanding the current high-grade Liese area, the North Zone, East Deep and South Pogo in addition to follow up work on two new discovery areas, the Goodpaster and Fun Zone. respectively. A relative newcomer is Contango ORE, who holds a joint venture with Royal Gold on the Peak Gold Project near Tetlin. Discovered in 2013, the Peak Gold project is now advancing through a preliminary economic assessment. Nearly 2 million ounces of gold have been delineated since drilling began in 2013. Further southwest lies NovaGold’s [NG-TSX, NYSE] and Barrick Gold’s [ABX-TSX, NYSE] joint ventured Donlin Gold Project. Not only an example of another successful native partnership in Alaska, but with approximately 39 million ounces of gold in the measured and indicated resource categories, inclusive of proven and probable reserves, Donlin is one of the largest undeveloped gold deposits in the world. Located some 450 km west of Anchorage and on land owned by the Kuskokwim Corporation, which holds the surface rights, and Calista Corporation, which owns the subsurface rights, Donlin Gold anticipates producing 1.1 million ounces of gold annually over a 27-year mine life. Additional exploration potential still remains as the currently planned pits occupy only three km of an eight-km long mineralized belt. In April 2018, Donlin received its final environmental impact study from USACE (US Army Corps of Engineers), which represents a significant milestone for the company as it continues to advance the project through the permitting process. Near Haines, the Constantine Metal Resources [CEM-TSXV] Palmer Project, a copper –zinc –gold -silver project is continuing with its’ successful exploration program on its low-sulphide VMS (actually a massive sulphide-sulphate deposit) with an unusually high barite content. Recent 2018 drill results on the new 2017 AG zone discovery reported 43.3 meters grading 143 g/t silver, 0.5 g/t gold, 6.5 % zinc, 2.5% lead that includes 28.8 meters grading 141 g/t silver, 0.5 g/t gold, 9.0% zinc, 3.5% lead. A 2015 inferred mineral resource estimate on the project (currently being updated) is 8.1 million metric tonnes grading 1.4% copper, 5.25% zinc, and 0.32 g/t gold and 31.7 g/t silver. The project is being advanced as a joint venture partnership between Constantine (51%) and Dowa Metals & Mining Co., Ltd. (49%). A 10,000-metre diamond drill program commenced in June that is aimed at both exploration for new deposits as well as expanding and defining mineral resources on the South Wall zones and the new AG Zone discovery at Palmer. Additionally, this spring, Constantine announced the leasing of Johnson Tract property, from the Cook Inlet Region, Inc. (CIRI), another Alaska native corporation. 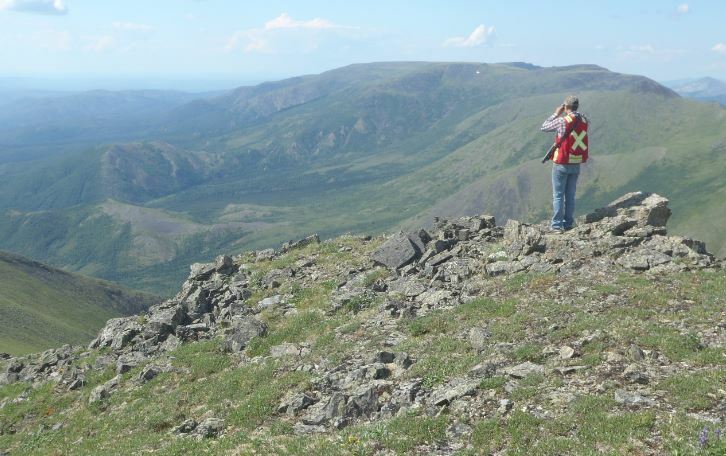 Located 200 km southwest of Anchorage, the property includes the high grade Johnson Tract Au-Ag-Zn-Cu-Pb deposit along with excellent exploration potential as indicated by several other prospects over a 12-km strike length. Originally discovered in 1982 by Anaconda who intersected 102.6 meters grading 10.94 g/t gold, 8.01% zinc, 0.75% copper, 2.13% lead and 8.5 g/t silver, including 50 meters grading 20.0 g/t gold, 9.4% zinc, 1.0% copper, 2.8% lead and 12.7 g/t silver. The last work on the property was in 1995. Constantine’s current plans include validating the historic work and resources to bring it up to NI 43-101 requirements. Northern Dynasty’s Minerals Ltd.’s [NDM-TSX; NAK-NYSE American] Pebble Project remains a focal point of environmental opposition, nonetheless it has the potential to be one of largest copper gold mines in the world, which if nothing else is a testament to the geological prospectivity of Alaska. At a 0.3% copper equivalent cut off, the current resource estimate includes 6.5 billion tonnes in the measured and indicated categories containing 57 billion lb copper, 71 million oz gold, 3.4 billion lb molybdenum and 345 million oz silver; and 4.5 billion tonnes in the inferred category, containing 25 billion lb copper, 36 million oz gold, 2.2 billion lb molybdenum and 170 million oz silver. Palladium and rhenium also occur in the deposit. What the company calls its “smaller footprint, no cyanide” mine design is currently advancing through the US Army Corps led NEPA 404 permitting process and the Corps have indicated publicly that they are targeting a Final EIS next year and a Record of Decision in 1H 2020. Graphite One Resources Inc. [GPH-TSXV; GPHOF-OTCQB] continues to develop its Graphite Creek Project, located about 55 km north of Nome, where a feasibility study is currently underway. Graphite Creek is the highest-grade and largest known large flake graphite deposit in the US and could potentially become an American producer of high grade Coated Spherical Graphite (CSG) that is integrated with a domestic graphite resource. The project is proposed as a vertically integrated enterprise to mine, process and manufacture high grade CSG primarily for the lithium-ion electric vehicle battery market. The projects listed above are only a smattering of the projects that exist within this hugely prospective State. The Alaska Division of Geological & Geophysical Surveys (DGGS) offers a wealth of digital data ranging from airborne geophysical survey data to geological maps and reports to geochemical data in order to assist companies with their evaluation of the exploration potential of the State. A state led large mine permitting team is also available to companies wishing to utilize their services. For many their impression of Alaska exploration is it is remote and expensive, but in actuality the average Alaskan discovery cost is $23 per ounce of gold which is considerably lower than $83 per ounce of gold for the western world, largely a result of the significant size of the gold deposits discovered in Alaska. Many of the areas with the best exploration gold potential in Central Alaska are well serviced by active roads as well as grandfathered state road corridors that survive from the gold rush days. With a population of under 1 million, largely located in the major urban areas of Fairbanks and Anchorage, Alaska also offers a unique advantage to mining companies exploring within the State with two cities acting as major central supply hubs to various communities located throughout Alaska. Anchorage is a major hub for freight entering and leaving North America, and ranks number 4 for air cargo throughput in the world surpassed only by Hong Kong, Memphis, and Shanghai. In 2017 about 2.7 million metric tonnes of freight passed through Anchorage. So why Alaska? The answer is obvious, as there are few places in the world today that offer such unbridled potential as this last frontier state. With its already defined potentially world class deposits, significant geologic potential, settled land claims, all located in the confines of a stable North American jurisdiction, Alaska has the potential to become the future of mining exploration and development in the United States.